I enjoy living at Carlyle Placesubmitted by Michael R. - Jul 30, 2013 |Recommended: YesIts the best apartment building that Ive ever lived in. The staff, mostly the concierge are very personable which makes you feel like their friends/family. It's close to anything that you might need. Very centrally located. Centrally located and friendly staffsubmitted by Darlington L. - Jul 29, 2013 |Recommended: YesIts only been a couple months, but we've enjoyed living here thus far. My only complaint would be the house keeping staff that cleans the club and fitness rooms. They don't seem to be working and always talking to one another. Also, one of the treadmills has been out of order for weeks now. response from property - Jul 30, 2013 Thank you for the review,we apologize that the treadmills are not working properly. We were unaware there was an issue with them and appreciate you letting us know. We have scheduled a technician to come out and make the necessary repairs, they will hopefully be up and running soon. It is a great place to live and the rental rates are reasonable.submitted by Rose T. - Jul 04, 2013 |Recommended: YesIt is a great place to live. Close to Old Town and the major highways. My only issue is with the inability to have proper visitor parking. Amazing, Flawless and Friendlysubmitted by John N. - Jul 02, 2013 |Recommended: YesCarlyle Place in an amazing Property. They have everything you need and could ever ask for. The staff is always friendly and available for a question or to help you with anything you may need. The Maintenance staff fixes everything right away and are also very friendly. The property manager is amazing and should get a raise. He is the most friendly, outgoing person and takes his job very seriously. 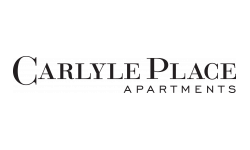 We love the entire building and I would tell anyone looking for a beautiful place in Alexandria to move to Carlyle Place. Great place to livesubmitted by Edward D. - Jul 01, 2013 |Recommended: YesRight place, right quality, right price, larger for the price than everything else we saw that is also easy commute by metro, need better AC in the hallways. response from property - Jun 19, 2013 Thank you for your review, we are always looking to improve our communities and your feedback helps us do that. We appreciate your feedback. Greatsubmitted by Brigitte S. - Jun 05, 2013 |Recommended: YesI have not lived here long but I enjoy piece of mind, noise free and very friendly. response from property - Jun 12, 2013 Thank you for the review! Great customer servicesubmitted by Rick C. - Apr 21, 2013 |Recommended: YesGreat location to Old Town and Eisenhower Metro stop. Modern well built building. Nice amenities. Customer services from the leasing office is fantastic! Outstanding - tenants are treated like family!submitted by Bryan P. - Apr 03, 2013 |Recommended: YesSupberb all te way around; staff, maintenance, concierge, and a great location. We save a lot by eliminating the need to drive; Metro is across the street, top of King street around the corner...even lower King and the harbor are only a 15-20 minute walk. We love it!submitted by Andrew F. - Feb 20, 2013 |Recommended: YesVery professional staff, clean common areas, great sense of security, maintenance is a-class! Thank you! It ia a wonderful community where everyone is extrememly helpfulsubmitted by Phyllis J. - Feb 01, 2013 |Recommended: YesDoes not hesitate to asssist in solving any issue....I'm extremly pleassed and glad I found this place....it's wonderful!